To create a vibrant exotic border under the deep, summer shade of a couple of Beech trees requires extra thought and consideration because many exotics prefer warmth and brightness to thrive. I chose a backdrop of reliable, shade-loving shrubs that had an exotic quality to them to provide a shelter belt. Then I planted up the remaining area (about 1.2m deep and 5m wide) that had some afternoon sun with a combination of grasses and herbaceous perennials. Some tender annuals (about 10% of the total) were added for temporary highlights. 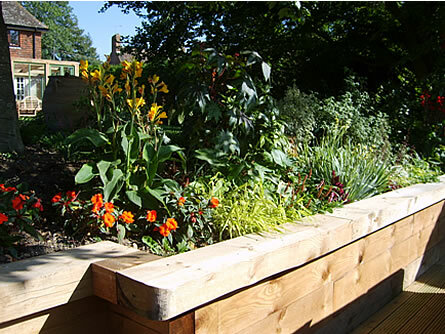 This border was retained by a sleeper wall which ensured that the soil depth was generous. At the front of the bed, the soil was good; towards the back, along the line of the Beech trees, very thin and chalky and had to be improved. The bed was heavily mulched after planting. This photograph was taken on 4th September; the picture below shortly after planting at the end of May.